Don"t let your disability hold you back! CareCo Southampton showroom on Maybush Corner has all of the mobility aids to help you take back control of your life. We stock a wide range of electric wheelchairs, walkers, bathroom aids, mobility scooters, and riser recliner chairs to make your life a little easier, and help you get out and about and see the world. Our helpful staff will take you through every step of the buying process, to help you understand what you"re buying and to make sure it"s the right solution for you. Get in touch with CareCo Southampton today, or visit the website for more information. 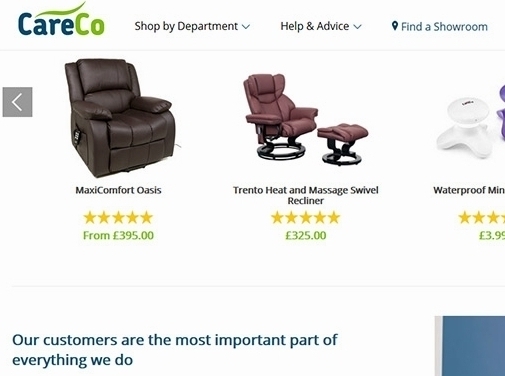 UK (Brentwood, Essex) based business - with over 13 years' experience - providing mobility scooters, riser recliner chairs, electric wheelchairs and other mobility aids. Website includes e-commerce facilities, delivery and returns information, "meet the team" page, details of business premises, FAQs, blog, associations, full contact details including company registration and VAT numbers.